I don’t know whether it’s because I’m dedicated or masochistic, but I woke up at 3:00 AM in Serbia to live-tweet the Democratic presidential debate. In retrospect, staying in bed would have been a better choice. 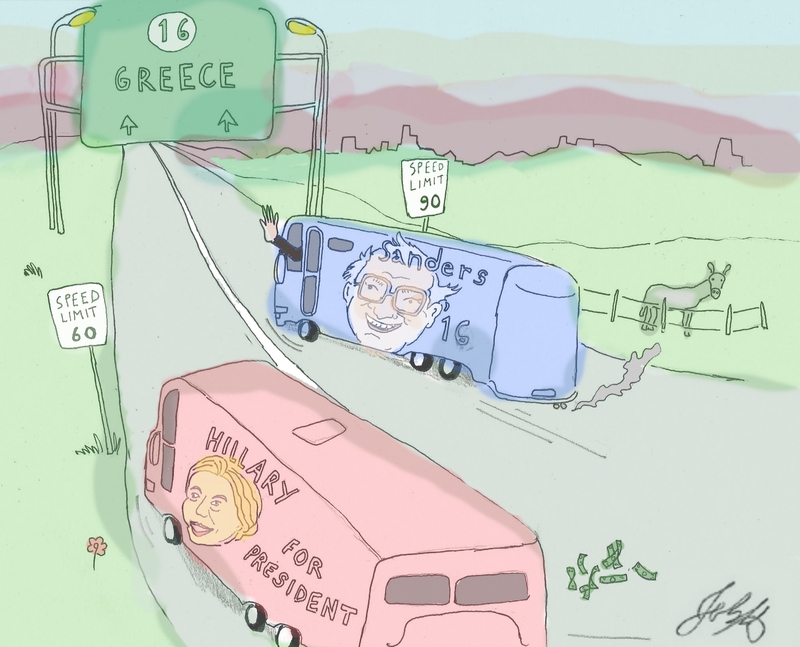 This debate was basically the same as the others, with both Hillary Clinton and Bernie Sanders competing on who could turn America into Greece at the fastest rate. Both candidates argued for higher tax rates on evil rich people, as well as sinister corporations, ostensibly because bigger government will make America more equal. For those who care about the real world, however, this isn’t such a good idea. Larry Lindsey, a former Governor at the Federal Reserve, writes in the Wall Street Journal that leftist policies actually cause inequality. …when you look at performance and not rhetoric, the administrations of political progressives have made the distribution of income more unequal than their adversaries, who supposedly favor the wealthy. …inequality rose more under Bill Clinton than under Ronald Reagan. And it wasn’t even close. While the inequality increase as measured by the Gini index was only slightly more during Clinton’s two terms, the Theil index and mean log deviation increased two and three times as much, respectively. Barack Obama’s administration follows this pattern… The Gini index rose more than three times as much under Mr. Obama than under Mr. Bush. The Theil index increased sharply during the Obama administration, while it fell slightly under Bush 43. And two big factors are easy-money monetary policies that artificially push up the value of financial assets (thus helping the rich) and redistribution policies that make dependency more attractive than work (thus hurting the poor). Democratic presidents presided over bubble economies fueled by easy monetary policy. There is no better way to make the rich richer than to run policies that push up the price of financial assets. Cheap money is a boon to those who have access to it. …Transfer payments under Mr. Obama increased by $560 billion. By contrast private-sector wages and salaries grew by $1.1 trillion. So for every $2 in extra wages, about $1 was paid out in extra transfer payments—lowering the relative reward to work. …the effective tax rate on the extra earnings—including lost government benefits such as food stamps, the earned-income tax credit, and medical support payments—is between 50% and 80%. This phaseout of the ever increasing array of benefits has created a “working-class trap” instead of a “poverty trap” that is increasing inequality and keeping the income of these households lower than they might otherwise be. I especially like Larry’s conclusion. He points out that statist policies have a long history of failure. The only real beneficiaries are members of the parasite class in Washington. None of this should really be surprising. If the socialist ideal of “from each according to his ability, to each according to his need” worked in practice, the Berlin Wall might still be standing. …Redistribution through the political process is not costless—even in a perfect world there would be a large bureaucracy to feed. Special-interest elites also emerge when so much money is being moved around. They take their cut, introducing even more inefficiency into the system. …voters who think the progressives running today are going to reduce inequality are falling into the same trap as people entering fifth or sixth marriages—the triumph of hope over experience. So why do our friends on the left have such an anti-empirical approach to the issue of inequality? Instead of fixating on inequality, why don’t they focus on policies that will actually help poor people? Some of them probably don’t care. They simply view class warfare as a way of creating resentment and getting votes. The problem is that they suffer from the fixed-pie fallacy. My Cato Institute colleague Chelsea German explains this fundamentally flawed understanding of the world. “The rich are getting richer and the poor are getting poorer.” Senator Bernie Sanders first said those words in 1974 and has been repeating them ever since. …A simple logical error underlies Sanders’ belief. If we assume that wealth is a fixed pie, then the more slices the rich get, the fewer are left over for the poor. In other words, people can only better themselves at the expense of others. In the world of the fixed pie, if we observe the rich becoming richer, then it must be because other people are becoming poorer. Fortunately, in the real world, the pie is not fixed. US GDP is growing, and it’s growing faster than the population. And it’s not just the U.S. data on how all income classes are climbing over time. Check out the “hockey stick” showing how the entire world is becoming richer. Last but not least, Kyle Smith also addresses the topic of inequality in his New York Post column. He starts by explaining there isn’t a problem. …there is no inequality crisis. …The US is only 42nd (out of 117 countries measured) in income inequality, according to the World Bank. We’re only 16th when it comes to the wealth held by the top 1%. He then makes a far more important point, which is that it’s good to have an economy and a society where people can become rich by providing goods and services that the rest of us value. Inequality is to some extent a residual effect of success: If there weren’t any billionaires or millionaires, inequality would be vastly diminished. America attracts and breeds success so brilliantly that we nearly beat the rest of the world combined in some respects: 42% of the world’s millionaires are Americans, and 49% of those with $50 million or more in assets. The American tendency to respect, and expect, success runs counter to the progressive plan to tax it away. He basically reaches the same conclusion as Larry Lindsey. In other words the left’s favorite policies help Washington insiders and hurt poor people. A cap on incomes above, say, $100,000 would massively increase both equality and poverty as millions of middle-class people whose jobs depend on the rich in one way or another found themselves unemployed. …People tend to suspect, rightly, that government intervention in the name of fighting inequality will lead to exactly what’s happened in the Obama era: more inequality, with bureaucrats and their cronies standing to gain. By the way, here’s a satirical Jonathan Swift version of what happens when you get rid of “rich” people. P.S. Here’s my video on class warfare, featuring the clip of then-candidate Obama saying he favored a tax hike even if it imposed so much economic damage that the government collected no tax revenue. P.P.S. The President isn’t the only leftist to have this spite-driven mentality. Rich people don’t get rich by making other people poor. What I find a more interesting question though is: Why had the American voter-lemming been least attracted to redistribution (compared to other nations) so far? Something seems to have changed. What happened? Did he finally figure out how democracy works? Most importantly, what will be the end result of copying the rest of the world? It’s legislation and political attitude that makes culture, just a much as the other way around. Once Americans are placed in a self inflicted European environment, they will start acting as Europeans too. Entrepreneurship, ambition,… those aberrant by world standards unique American enablers of prosperity? Forget them. Once America Europeanizes they will be gone. It won’t be long before the American voter-lemming starts voting and acting like his French brethren, and then his Greek one. The voter-lemming obviously likes current redistribution. He has spent his life to-date rejecting the concept that studying, planning, and saving for the future would give him a far better life. If he bothers to think of himself as a failure, it is obviously someone else’s fault and they should pay. He neither sees nor appreciates the result of past “selfish” growth. So he’s out to dismantle it. Consequently, the voter-lemming does not see how much bigger his American pie is. He only sees the extra few crumbs that the leftist politician is promising to redistribute. To the voter-lemming, a redistribution dollar today (another crumb from the pie) is worth five perpetually compounding growth dollars in the future (the growing pie). Growth and prosperity will have to escape to places where voters are not the typical lemming. Socialists claim that incentives do not matter. If so why do they agitate for redistribution? Could it be that there’s an incentive?